Jonnie McIntosh lost her pregnant granddaughter in a drug deal last year, and two weeks ago her grandson overdosed on spice, or synthetic marijuana. The 70-year-old woman was so sick of the manufactured substance that she’s taking new measures to protect her family. When the drug dealers came back to settle her grandsons’ $20 debt from a prior purchase, the elderly woman was held at gunpoint. When she was able to get back inside her home, she didn’t come back with money. “I went inside and grabbed the gun,” McIntosh said, and added that her and the attempted robbers had a short stand off before they retreated. And she had a message for the rest of the spice community visiting her suburb. 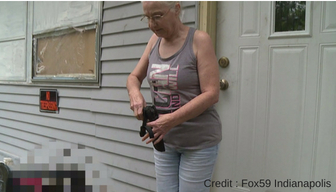 The grandmother from Indiana confessed she doesn’t like guns, but after the havoc that was wreaked on her family, she knew she had to do something to protect what was left. So she bought a glock, because the dealers are on every street near her house on N. Berwick. and her grandson is struggling with staying clean. “If you are stupid enough to sell it to these kids..you get what you deserve,” said McIntosh. But she’s having a hard time seeing the drugs appeal after seeing its effects on her young grandson. “I do not see what they get out of it. Who wants to sit there passed out and do not have a clue what is going on around them,” McIntosh told Fox59 affiliate. “Back in my day, it was marijuana and Boones Farm wine. That is all my parents had to worry about. This stuff has bug spray in it and all kinds of chemicals. Whatever they decide to spray on it. Any way that they can get high,” She exclaimed. Spice has started to consume Indianapolis and in the last month emergency medical crews were sent to tend to nearly a dozen drug overdoses within a mile of McIntosh’s home. She expressed her feelings towards the local drug dealers and had a message for the pushers, “Get off your lazy rump and get a job. Quit pushing drugs on these kids,” said McIntosh.